Everyone has that special food they really miss from home. I didn’t become aware of mine until I was just craving it. Italian sandwiches are just about my favorite food in the world. It really got bad when I had a short stint working at Jersey Mike’s Subs. Jersey Mike’s has been in the business for a long time. They started on the Jersey shore and slowly expanded. The guy who started Blimpie used to work for them. I really got into their Jersey style Italian sandwiches. There were many ways to make them, but there were a few techniques and a few rules, or the sandwich was ruined. The trick, as with any western food in Korea, is in finding the ingredients. Scouring around at my local E-Mart, I found frozen imported balogna and salami. Better processed meats are popping up in the refrigerated section, next to the cheddar cheese. From that I got a stick of pepperoni-style hard salami and a little block of ham coated in cracked pepper. That took care of the meats. I got some cheddar cheese from the same case where I got the ham and hard salami. I know the Kim’s Club at Beomgye station has swiss cheese, but I’ve been too lazy to go down there. Now, of course, making a sandwich is a no-brainer. Put something in between two slices of bread. Simple. I’m not going to insult your intelligence by telling you how to make a sandwich. Yet there are ways to make one better. The great tool for sandwich making is one of those cheap plastic slicers. The metal ones are called ‘mandolins’ and are expensive. This cheapo slicer is great because you can just chuck it and get a new one when it wears down. 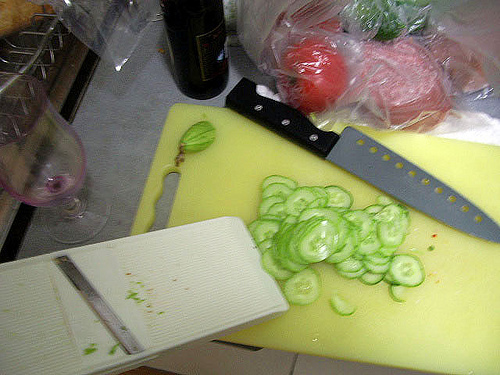 The first thing I do is slice vegetables. In this case, some cucumbers and lots and lots of thinly sliced onions. I then shave the ham and pepperoni. This can get a bit dangerous, so here’s a safe way to do it. Get a work glove to protect your hand. Cover the work glove with a plastic glove for sanitation. It’s some work, but I just love shaved ham. One technique I sometimes do with a sandwich like this is scoop out the insides. I learned from Rodney Dangerfield. Now, the big rule about Italian subs: Only oil and vinegar. NO MAYONNAISE! I coat the bread with extra virgin olive oil and balsamic vinegar. I then pile on the vegetables, including lettuce from a ssam bag (see Gumbo-less Gumbo) and some jalapenos (which are starting to pop up more frequently in supermarkets). On the other side, I laid down the meats, loosely piling the shaved ham. After putting the two sides together, the last thing I do is squeeze the bread. I learned this at Jersey Mike’s, and supposedly it’s a European technique. Squeezing it helps the flavors meld together. I remember watching the Two Fat Ladies , and they put a brick on a sandwich to give the same effect. In fact, tightly squeezing and wrapping the sandwich and letting it sit in the fridge overnight makes it taste better. What is the address & name of the bakery w/ garlic baguettes? Paris Baguette is a bakery chain. Usually not the big ones. I saw I didn’t mention Paris Baguette in the post. Sorry.